What’s the biggest challenge in your business? I’m going to guess and say growth is in the top 3! If not, well done, you’re doing better than 99% of businesses wishing they had more/faster growth. This post is a list of the most creative marketing ideas we’ve seen customers of VYPER implement and get amazing results from. Whether it be growing their email list, video engagement, social channels. app store rankings or hacking their Facebook ad engagement. This stuff is gold! Everyone can see a stock or brand photo/image from a mile away! You’re not fooling anyone. A little growth hack around this is using user-generated content in your emails, ads and on your website. The trick is getting this user-generated content without spending a ton of money or hours asking for it, following up and dealing with Dropbox links. The easy way to automate this and get a ton of user-generated content! Step 1 – Create an evergreen contest that is part of your purchase email drip (triggers after someone purchases from you). Make sure the customer gets this email containing your contest after they have received their product. Step 2 – Choose a prize e.g. $500 gift card, 50% off your next order or a free/complimentary product. Step 3 – Create a contest that requires people to upload a photo to Instagram, the photo has guidelines like (it has to be you using the product). If you do not want people to upload it to Instagram you can also choose the direct upload bonus entry, the Instagram entry just gets you a little bonus social impressions! Step 4 – Watch those entries roll in! Here’s an example of the contest if you want to take a look. Facebook’s all the rage, but unfortunately, like all good things, the effectiveness is decreasing every year. Organic reach is dropping, engagement is dropping and CPA’s (cost per acquisition) are increasing! What do you do when things like this happen? Innovate and find ways to “game” the system, that’s exactly what this marketing tactic is about. Step 1 – Create a contest with the bonus entry of liking, commenting and sharing a Facebook post you create. Make sure this post that you create is adding value and has a soft sales pitch in it, like an educational video with a discount and link to the purchase page in the text area (we will want to turn this into an ad later). Make sure to ask people to do all three actions. You can ask them from 1 bonus entry or make a separate bouns entry for each engagement type. Step 2 – Run and promote the contest. Add it to your website, email your list, run some ads etc. Over the duration of this contest, you will start to collect hundreds of social engagements. Step 3 – When you have enough social engagement, a good number is 100+ likes, comments, and shares, turn that post into an ad. Step 4 – Scale this Facebook post to the audiences you want to target and benefit from the higher CTR’s, engagement rates and relevancy scores. By using this method you can show social proof and build engagement for free. 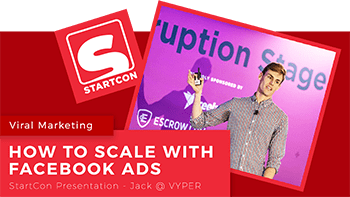 By having more social proof, your ad becomes “scroll stopping”, people are much more likely to stop and notice your post if it has hundreds of likes compared to a brand new ad with nothing. YouTube is one of the most under-utilized platforms there is. A lot of people don’t realize this but it’s actually the 2nd biggest search engine. Yes, Google owns everything! It’s a fantastic place to upload all your video content; branding videos, tutorials, how to videos, testimonials, product launches, webinar replays and more. You should be uploading and organizing all the content you can on this channel. One of the best ways to prove authority is to have videos with lots of views, thumbs up and comments. Organically this is not easy, you have to get lucky, work really hard at engaging viewers or wait a super long time before you get anything impressive. The hack for this is to incentivize these actions using your contest. Not only are you collecting leads but why not put those leads to work. Step 1 – Set up your contest, set a reward, pick a contest type (flash contest or an evergreen contest which is when you pick 1 winner a month or week). Example. Step 2 – Add your bonus entries for YouTube, you can also do this for Vimeo or other video content directories! Step 3 – Add that contest to your checkout page, email drips, social channels or website. This is one of the easiest ways to keep your social accounts growing and your existing customers, followers and leads feeling special. This is the example banner we also use in our emails and on social to get people to enter our evergreen contest. Make your images stand out, explain what the prize is and if you can, the value of it to them! A few reasons why you would want to use this marketing strategy. 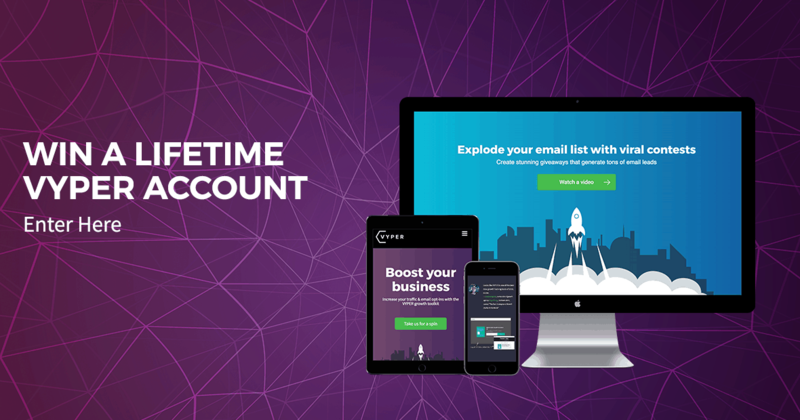 It’s a great addition to your email drips for leads and customers. Keeps them excited to open your emails. It keeps your social channels growing (followers, shares etc). You have a constant stream of new leads into your funnel and they are referring others just like themselves. You can get people to constantly be sharing your content (Facebook, Twitter, Reddit, any channel). You can change up the bonus actions every month depending on what your monthly goals are (One month we wanted to incentivize signups to our webinar, the next we wanted to grow our YouTube video views). This also gives you a great landing page to promote when you sponsor events, speak at events, guest appearances on podcasts, run joint promotions & email blasts as well as provide influencers with something to promote that people can actually benefit from instead of just asking for a sale. The beautiful thing is that when you send people to this evergreen contest, it looks like you’re doing them a favor by offering something for free. But you are actually collecting their email as well as incentivizing them to complete a whole list of actions. Just look at all the things we made you do in our monthly contest above. Here’s the email we added to an email drip to re-engage people who have created a VYPER account but not activated a paid plan. We know they are interested so maybe a free product will incentivize them to come back to our website. It also squeezes a bit of value out of them if they go and complete all the bonus actions of following us on social, sharing our content and leaving us a review. Share on podcasts or at events etc. Having this asset in your marketing toolkit gives you an asset that provides value and is easily shared and managed. Once you create the contest, just draw a winner and move the end date one month back on the last day of every month. Podcasting is now a great awareness and authority building channel. Not only do you produce a TON of content but it’s now very doable with the advancements in recording and self-publishing. You can create an educational or interview style podcasts to build an audience of listeners to then one day sell to (I know that sounds bad but that’s the point of the podcast. Give value, get sales in return). I’ve personally been on a few podcasts now (open guest requests hint hint) but the one thing that always comes up is how to market your podcast and get more reviews to increase your ranking in the iTunes store (the most common one, there are others like Twitch etc). A great way to do this is…. You guessed it, incentivize it. 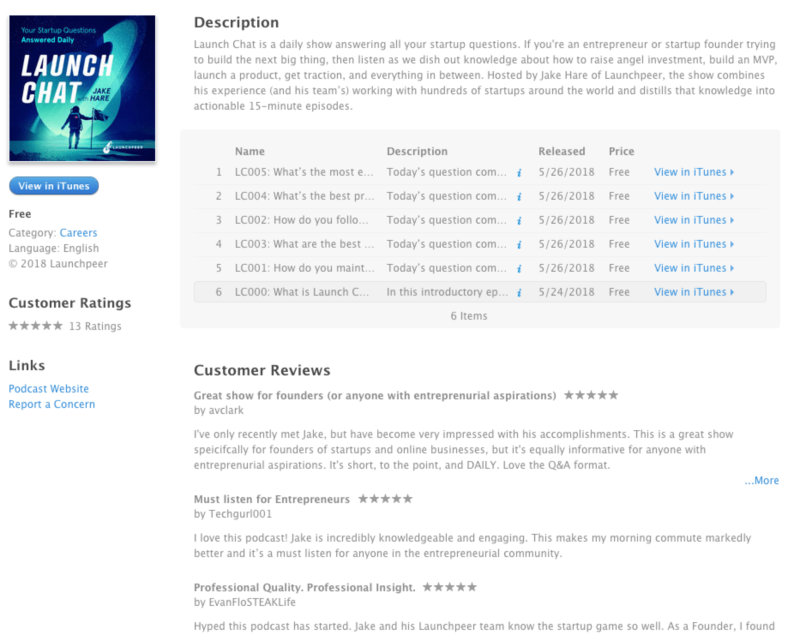 This works really well for the launch of a podcast, two podcasts that I guest spoke on LaunchPeer and The Social Media Growth Show used a contest to grow their listeners/subscribers and game the podcast charts early on to appear in the top podcasts for business. The way they did this was using a launch contest. You can see the contest was giving away a prize that would attract the right people (marketers and business owners). 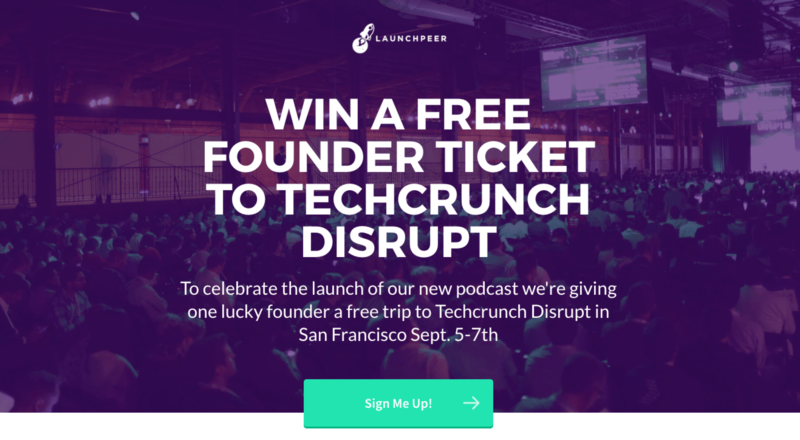 These were the people that LaunchPeer wanted to listen to their Podcast. This contest generated 13 five star reviews (probably more by now as I wrote this while the contest was running), a bunch of social shares and YouTube subscribers within the first few days of launch getting it ranked high in the iTunes podcast charts. Below are a few of the bonus entries that this company used to get people engaged with their new podcast. 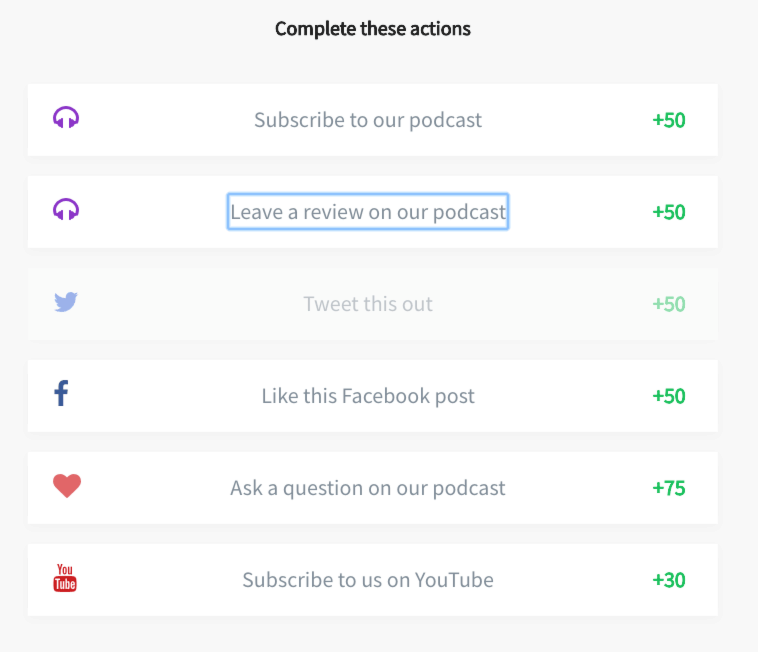 The goal is to get your new podcast in as many social feeds as possible and collect as many subscribers and reviews within the first week as possible. The early signs of traction are rewarded with higher placement in the iTunes store and even the possibility of being featured at the top of your category, remember to choose a sub-category to increase your chances. For example, instead of choosing Business, choose Business -> eCommerce as your primary category. Here’s also a great post on how to get to the top of the iTunes podcast charts. For the revenue to happen you need the downloads, this is the first step and the direct response conversion goal to optimize to. Paying for downloads and installs can get expansive $3-15 CPA’s are common depending on your industry, For example, an install on a free game is going to have a way cheaper CPA than a paid finance app. A little hack we have seen VYPER customers using to cut their CPA’s is including the app download from iOS and Play Store in their contest. We recently added a templated bonus entry for this due to demand for app contests. 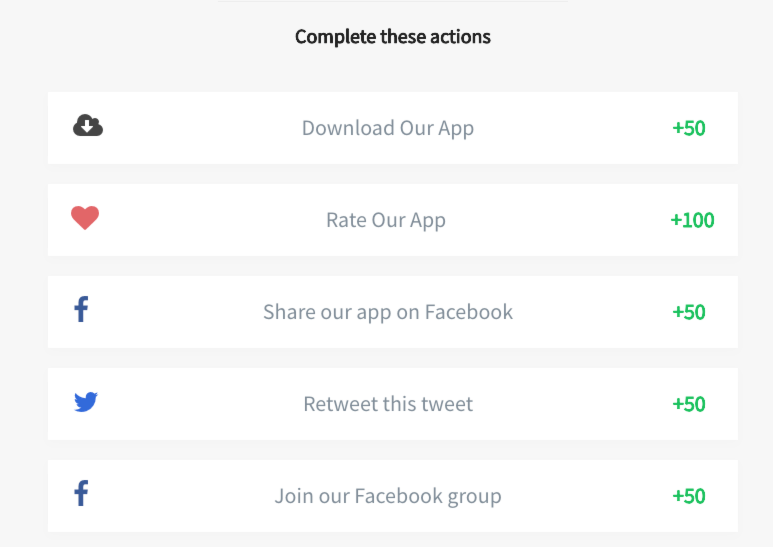 Not only that but you can also use the entries to incentivize other actions to improve your app marketing efforts. Example. The list goes on as these are customizable actions you can create. What Next? It’s your turn! 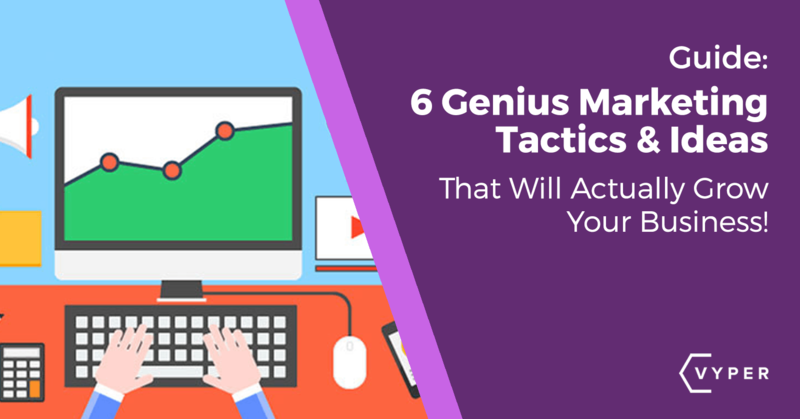 I’m sure your head is filled with ideas at this point and hopefully, some of these hacks will give you some actionable tasks to better market your product, app or service. If you have any questions or hacks to add, leave them in the comments below!